We have expanded Men’s Night into a Full Day Event. Join us on Saturday March 2nd for a day filled with encouragement, challenge, food and fellowship. Check in is at 10:00 am and we will be done around 8:00 pm. Greg Lee will be bringing the main session message, Ignite and Unite will lead us in worship, several workshops will be offered, and Danny Cox, Roland Nightengale and Eric Fournier are preparing challenges that will be sure to be talked about for years to come. This summer we will be supporting CrossRoads Missions in a variety of ways. CrossRoads Missions is a doorway for churches and individuals seeking ministry opportunities in places they may otherwise have difficulty serving. CrossRoads Missions enhances existing local ministries, supporting them with additional resources they may be unable to provide. To support the mission, Connect Christian Camp is asking you to first and foremost pray for the work that CrossRoads is doing, and second consider donating items for their outreach programs. 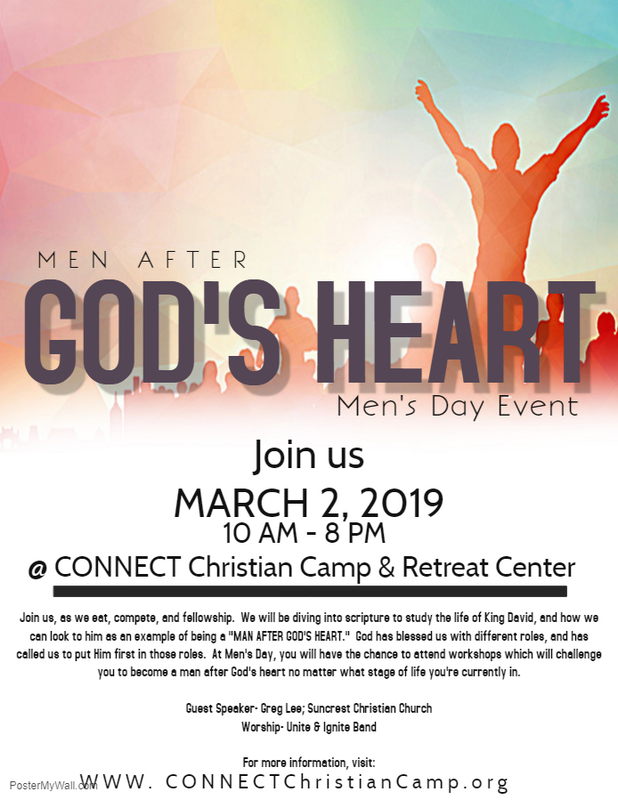 Please click on this link to find a list of items we would love for you to bring with you to Men’s Day. Ladies Retreat is back with the very popular Friday Night Girls Night. Pick a pampering option (manicure, massage, facial), do a craft or just enjoy some time together. Check In starts at 5:30 on Friday March 8th and we will be done around 3:00 pm on Saturday. Deanne Mott will deliver the main session message. Savanna Moore will lead us in worship. Saturday will feature two break-out sessions, a craft, great food, a service project and more. This summer we will be supporting CrossRoads Missions in a variety of ways. CrossRoads Missions is a doorway for churches and individuals seeking ministry opportunities in places they may otherwise have difficulty serving. CrossRoads Missions enhances existing local ministries, supporting them with additional resources they may be unable to provide. To support the mission, Connect Christian Camp is asking you to first and foremost pray for the work that CrossRoads is doing, and second consider donating items for their outreach programs. 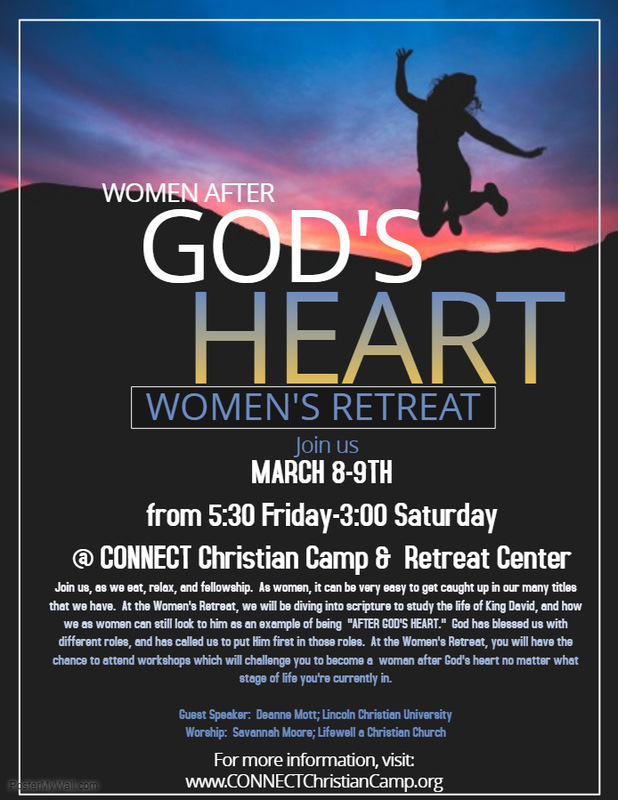 Please click on this link to find a list of items we would love for you to bring with you to Women’s Retreat.